DivX Author is a full-featured DivX authoring program, allowing you to create videos and slide shows that take advantage of the advanced features of DivX including interactive menus, chapters, multiple subtitles and audio tracks. Aimed at professional DVD makers and studios the DVD Menu Studio complements the professional DVD authoring packages used in the creation process. DVDAuthorGUI is a basic win32 frontend for the DVDAuthor project. The GUI is meant to be an easy means to create a basic DVD. 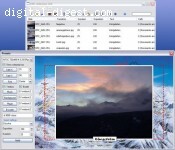 A DVD authoring application which creates DVDs from almost any kind of video files (if the necessary codecs are installed). Easy DV to DVD is easy-to-use DV to DVD transfer and DV to DVD burner which can convert DV to DVD, transfer full DV or a segment of DV to DVD disc. The DV to DVD converter also helps back up DV to DVD folder or ISO file.